By 1982, the NAD’s price was creeping up. True, it was now the 3020A with a few tweaks and slightly better sound, but at £109 there was a sense that the maker had adjusted its price to reflect the huge demand. It seemed to be getting away with it, until another small audiophile-oriented integrated popped up, seemingly from nowhere, and began to steal sales from the 3020 at a fair old rate. The £99 Creek CAS4040 was a beauty; it looked and sounded almost like an A&R A60 that had ’shrunk in the wash’, which was no bad thing. A black fronted, fairly minimalist design with a wooden sleeve, like the twice-as-expensive A60 it had a rich and warm sound, with lots of power. Although the Creek appeared to have come out of nowhere, its designer Michael Creek was already a veteran of the industry, having worked in his father’s audio company, the Wyndsor Recording Co. Ltd. He was a classic example of someone who’d done every role, pretty much joining as the tea boy; he’d been a stock controller, component buyer, the factory manager and then a production engineer. He had a passion for hi-fi, including the affordable open reel and cassette tape decks, amps and tuners that Wyndsor made. Mike subsequently left his dad’s company to do freelance design consultancy, and then finally formed Creek Audio Systems in 1981. The CAS4040 put out 30W RMS per channel of AC-coupled, largely Class B biased power, but like the NAD could drive ‘real life’ speaker loads well and it proved a hit in Britain’s many independent specialist hi-fi dealers. It gave them a rival to the mighty NAD franchise, which they didn’t have if they were not a member of the (then) powerful Hi-Fi Markets retail chain. A tuner soon followed, and to everyone’s surprise – as tuners aren’t easy to do well – this clean-sheet design sounded superb; the CAS3040 consolodated the company’s success. Creek Audio – like so many British companies from the nineteen seventies and eighties – effectively started on Mike Creek’s spare room. But by 1983, it was making 100 pieces per week and needed to move to a proper, purpose built factory. At the same time, Creek began sub-contracting, a process which it continues to this day. It was all hands to the pump, because by 1985 the company was selling 1,200 amps and 350 tuners per month. The CAS4040 had a lovely, sweet and musical sort of sound, tonally far smoother than rival Japanese amplifiers, and even the rich NAD seemed just a tiny bit steely and mechanical by comparison. It was no valve amplifier of course, but by the standards of its Japanese rivals which were quite cerebral and dry in nature – and sometimes infused with upper midband glare that afflicts mediocre solid-state – it might as well have been. Music seemed to bounce along in a most enjoyable way, although in absolute terms the wee Creek was a little opaque and soft. The company’s response to this was the CAS4140, which did two things. First, slightly tweaked componentry made it put out a true 40W RMS per channel, which was just about the minimum any eighties amplifier needed to be truly universal; lots of loudspeakers of that time had very poor sensitivity (lest we forget, Celestion’s original SL6 made just 82dB per watt at one metre!). Second, it removed the tone controls, which for most people were a useless distraction anyway; cutting these out of the circuit made for more detail and grip. This really consolidated the company’s product range, and gave its competition something to think about – by 1985 it had Mission’s Cyrus 1 and Arcam’s Alpha 1 to worry about, along with Nytech’s CA202 and a newly strengthened NAD 3130. Just seven years after the stratospheric rise of Creek Audio Systems began, Mike sold his company. Mordaunt Short had been acquired in 1987 by the TGI group (including Goodmans and Tannoy), needed an electronics brand and Creek was approached. Mike stayed on as chief engineer, and worked on updating his budget amplifiers and tuners. In 1988 the CAS4040 was evolved into the S2 version which got major technical revisions and a minor facelift which included green fascia lettering. Although this was the company’s official colour, it didn’t make the amp any more of a looker! The 3040 tuner became the 3140, and got more rapturous reviews. Despite its low sensitivity, necessitating the use of a proper external FM aerial if you didn’t want a continuous stream of hiss, it sounded wonderfully natural and open – at a time when digital hadn’t broken into the FM signal chain. Later, this was replaced by the T40, which was much the same. 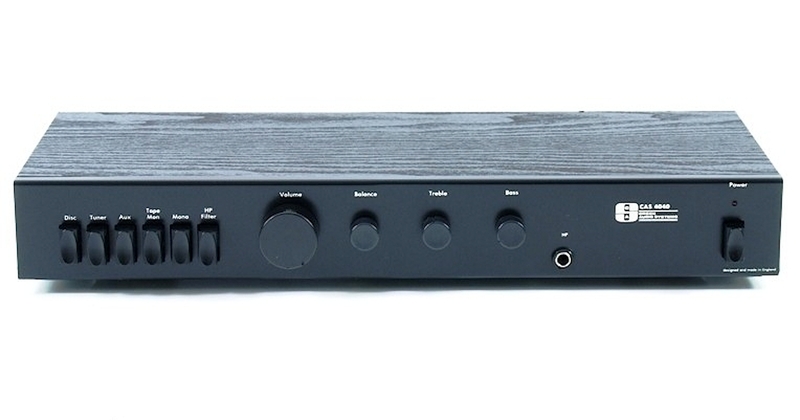 The CAS4040 S3 later appeared, before a new 5050 range of amps surfaced. After various labyrinthine corporate changes, Mike is back running his own company – Creek Audio Ltd. – and also the Epos loudspeaker brand. The company still makes some excellent amps, and recently introduced the Evolution 50A, a £750 design which is the spiritual successor to the long, lost CAS4040. Amazingly, it doesn’t sound that different either, after all these years – he must be doing something right! I still have a CAS 4040. What a great buy that was. Could be changing soon…..
An Exposure 3010 S2 would be a good modern-day replacement – more power, grip, punch and detail but just as creamy and musical… Creek’s own Destiny 2 is also lovely, a little softer and more valve-like but slightly less grippy.